The Last Chapter of Funk! The rock band ON-XYZ originally from Detroit, Michigan is now based in Florida. The new band now has a new line-up consisting of drummer, Benny Cannon, bass and lead singer, Wilson Stern, Sita on violin and vocals, Aaron Piegue on acoustic and electric guitars and vocals, and KAS on keyboards and percussions. 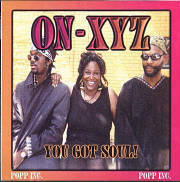 ON-XYZ in the past was a band that specializes in soul, funk, and reggae music. Today the musical focus of the band is funk, metal and modern rock music. ON-XYZ is an electrifying fusion of rock, funk, reggae rhythms and metal, with blistering instrumentals and body-shaking grooves. ON-XYZ, under the direction of band founder, music producer, and musician, KAS, has recorded and released many CD/Albums (Downloads and Streaming), including their mega hit, 45 and their 12-inch vinyl hit single, “Dread Wave”. The band has toured throughout the United States, Canada and Japan and performed with many of the major acts in the Funk, Reggae, Rock, and R&B category. ON-XYZ is currently involved in several musical projects and planning to tour in 2014 and 2015 for the first time in many years. A new album/compact disc, mp3 downloads, and streaming digital release featuring new songs is scheduled for release in 2014, titled, “The Best of ON-XYZ”. 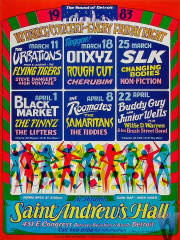 Musical performing and recording artists who have performed and recorded with the ON-XYZ band include: George Clinton, Black Uhuru, Steel Pulse, The Wailers, Jimmy Cliff, Judy Mowatt, Sugar Minott, Ohio Players, DeFunkt, Was Not Was, Miriam Makeba, Inner Circle, Chaba Fadela and Shabba Ranks. The legendary master jazz trumpeter Marcus Belgrave (Trumpet/ Flugelhorn); one of the Original Ray Charles band members, and Mentors to the "next" jazz generations including pianist Geri Allen, bassist Robert Hurst, alto saxophonist Kenny Garrett, saxophonist James Carter, and violinist Regina Carter; Michael Anthony “Mad Mike” Banks (Guitar), Michael Anthony Banks who is without a doubt the most controversial and politically outspoken member of the Detroit Techno community; he is also one of the most successful, having started his music career as a studio musician playing with Parliament/Funkadelic, and among others; the late, great Faruq Z. Bey (Saxophone/Composer/Flutist/Poet), the “Godfather of Avant-Garde Jazz in Detroit”, and founder of the critically acclaimed Griot Galaxy jazz group. Some other legendary musical performing and recording artists who have performed and recorded with the band also include: DeWayne “Blackbyrd” McKnight (Bass/Lead Guitar on “Body Rock” and “Don’t Leave Me (Club Mix)” by Virginity a/k/a Nita Jason); DeWayne McKnight was a member of The Headhunters, a jazz-funk fusion band from 1975 through 1978 and Parliament-Funkadelic from 1978 through 2008; Kevin T. Carter, Sr. (Guitars); Ron Smith (Guitar, Enemy Squad and P-Funk); David Myles (Guitar); Paul Randolph (Bass Guitar); Chico Jackson (Bass Guitar); Ras Kente (Guitar); Tony Stewart (Lead Guitar); Lonnie Motley (Bass Guitar,) former bassist with Kid Rock; Darryl “Moon” Mullins (Guitar); Michael “Clip” Payne (Vocals/Drums) Clip has been a member of the Parliament-Funkadelic collective since 1977, he has appeared on over 20 Parliament-Funkadelic funk collective recordings primarily as a vocalist and keyboardist; Tani Tabbal (Drums); best known as the drummer for Roscoe Mitchell's Sight and Sound Ensemble. The amazing drummer Tani Tabbal also added percussive support to Griot Galaxy and David Murray's big band and various combos and to sessions featuring A. Spencer Barefield and Cassandra Wilson; as well as, jazz legends Anthony Braxton, Oliver Lake, Muhal Richard Abrams, Henry Threadgill, and Richard Davis, James Carter, Geri Allen, Famadou Don Moye, and Obo Addy among others. In addition, here are several other noted musical performing and recording artists, and singers who have performed and recorded with ON-XYZ that include: Kamaal Amen Ra (Percussions/Vocals/Nomads); Malik Yakini (Guitar, Akoben, Samaritans, and Nomads reggae bands); Majid Abdul Kareem (Drums/Akoben/Nomads/ON-XYZ); the late singer Kareem Baaqi (Vocals/Nomads/Video Clip in Africa/Music and Links); Rodney Gipson (Keyboards); Bey Jackson (Bass Guitar/Drums); the Motor City Foundation annual Detroit Music Awards (May 18, 2008) recipient musician, Ras Kente (Guitar/Vocals); Elrita Dodds (Saxophone); Frank Kelly (Guitar); Jaribu Shahid (Bass Guitar); Modebo Keita (Percussions); Ricky Rouse (Guitar) Courtesy of Atlantic Records); Phienas Oliver (Vocals); Michelle Young (Vocals); Roni Sannyu (Vocals); Deep Omega (Vocals, Graphic Illustrator, and Funk Consultant); the late, Mallia Rosalind Franklin (Vocals); one of the original Parlets, and a vocalist with P-Funk and acknowledged as “Queen of Funk”; “Queen of Funk”; and Satori Shakoor (a/k/a Jeannette McGruder); also a former singer, vocalist with the Brides of Funkenstein and George Clinton's Parliament/Funkadelic; Shirley Hayden (Vocals), a former vocalist with Kid Rock and vocalist in George Clinton’s first female spinoff group, Parlet; Titilayo Akanke (Singer/Lead Vocals); Anita Johnson, as Virginity a/k/a Nita Jason (Singer/Vocalist); Olutaya Ka (Vocals); Kenni Register (Vocals); OC Roberts (Vocals); Raz Baaba Aaron Ibn Pori Pitts (Dub Poet/Videographer/Artist); musical wizard, Geter Most (Keyboards/Drum and Bass Electronics/Funk Lab Detroit); Christopher Kaercher (Saxophone); Ray Parrot (Drums) Jon-Paul Frappier (Trumpet); Jamal King Mellowman Clark (Vocal/Rapping); Eric Sharp (Sound Engineer) Masterpiece Studios, Detroit, MI; music producers and sound engineers, Scott Santos (Producer) and Ray J, Kozorra III, (Sound Engineer), Incidental Sound Company, West Bloomfield, MI; and the late music producer, John Keith Stewart (Executive Producer), and many other noted musicians, bands, singers and vocalists. ON-XYZ (ONYX is the original band name, and Onxyz) was a band of musicians that specializes in funk, metal, rock and “reggae music,” which gained recognition as Detroit’s first reggae band. Today the band still has the characteristic “sledgehammer sound” (hard-driving bass guitar and drums) of years ago. The band’s show is high energy with modern electronics, string instruments, guitar slicks, as well as their original music and sound which blends funk, rock, alternative R&B and metal into a reggae tinted sound that is their unique own musical trademark. ON-XYZ was awarded the Metro Times (Detroit) "Hall of Fame Award" in the Reggae Category, and for "Honorable Mention" in the World Beat Category. The group is mentioned in several issues of Reggae Report; a recent issue of Billboard Magazine; and has been featured in numerous past issues of the Metro Times, Detroit Free Press; Chicago Reader, New York Village Voice, and The Baltimore Sun. The Minneapolis Twin Cities Reader; and many, many other major newspapers throughout the Midwest and East Coast, (e.g., Iowa City, IA, Bloomington, IN, Washington, DC, and Champaign, IL) has featured stories about ON-XYZ in their pages. The Best of ON-XYZ New CD/Album/MP3 Release Coming in 2014 and 2015. 1 DANCE LITTLE CHILDREN DANCE, 12 inch single,Solar Sundanese Records, 1979. 2 WE CAME TO ROCK YOU, 12 inch single,Solar Sundanese Records, 1980. 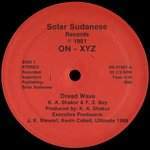 3 DREAD WAVE, 12 inch single,Solar Sudanese Records, 1981. 4 BODY ROCK, (as Virginity) 12 inch single,Sutra Records, 1986. 5 WOMB MUSIC, CD, Popp Records, 1987. 6 SHAKE-UP YOURSELF, CD, Popp Records, 1988. 7 RIGHT NOW! CD, POPP INC, 1993. 8 YOU GOT SOUL, CD/MP3, POPP INC/POPPMusic.net, 2014.